Jeffree Star Velour Liquid Lipstick retails for $18US for 0.19 oz of product. 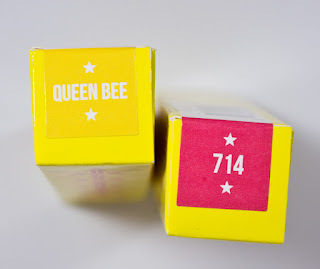 Jeffree Star Velour Liquid Lipstick Queen Bee & 714 boxes. The formula for the Weirdo, Unicorn Blood, and Rose Matter shades are on the thinner side but not too sheer. It only needed one coat to get full coverage on the lips. This also has a new scent of candied mint with vanilla that it is rather subtle which I sure is now part of the new formulation. The 714 shade is sadly very sheer and thin formula. I have to build it up in layers to get a fuller coverage look. Another issue I had with this shades was when I tried to work a new layer over the dried down product it would reactivate the bottom layer and remove it. I highly recommend finding a matching lip or eyeliner to first mask out your skin tone before applying this shade. The Queen Bee shade is a slightly thicker than some but the texture is really cushion on the lips with a matte finish. Queen Bee is semi-opaque in one pass and can feel heavy as you build it up heavy on the lips. My recommendation is to use a yellow eyeliner to mask out you natural lip colour first. Also, 714 and Queen Bee has been scented with watermelons. The scent is kind of weird as it dries down it smells more acidic with 714 but it really pleasant at first and fade to nothing once dried down. Weirdo is a pure black with a matte finish. The formula is very fluid so I recommend lining your lips first in black to prevent and micro-bleed lines before it dries down. 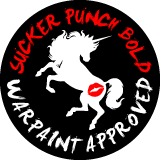 Unicorn Bloods is a brown based blood red with a matte finish. This one is semi-opaque. Rose Matter is a coral rose pink with a matte finish. 714 is a bright hot coral-pink with a matte finish. The pigment is sheer with this one and also needs some TLC to get it to look even. Queen Bee is a true hot yellow with a matte finish. This formula is on the thicker side like Drug Lord to make it more opaque. I can also be build up easily to get full-colour coverage. 714 breaks down on me in 4 hours because of it powdery finish once dried. Daylight swatches: Weirdo, Unicorn Blood, Rose Matter, 714 & Queen Bee. 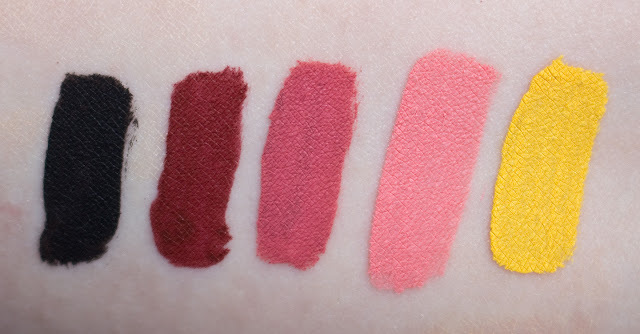 Flash swatches: Weirdo, Unicorn Blood, Rose Matter, 714 & Queen Bee. Jeffree Star Rose Matter, Anastasia of Beverly Hills Dolce and Kathryn. Weirdo is very similar to my Kat Von D Witches shade but I have to build up witches in 2 layers to get it fully opaque. For Rose Matter I do not have a dupe for but when I blend Anastasia of Beverly Hills Dolce and Kathryn you get a very similar shade. Jeffree Star Velour Liquid Lipstick in 714 and L.A. Girl Matte Flat Finish Pigmented Gloss in Fantasy. L.A. Girl Matte Flat Finish Pigmented Gloss in Fantasy. The L.A. Girl Matte Flat Finish Pigmented Gloss in Fantasy really reminded me of 714 because the shades are similar but both also have formula issue due to the pigment used. Needless to say, I'm not happy with either of them because the pigments used really messes up the wear time of the formulas. The new formula is still really nice to work with given how pigmented most of the shades are in them. 714 if you really love the shade than be prepared to work fast with it and maybe use an eyeliner to lighten your lip colour so that it doesn't show through as easily. Queen Bee is kind of bomb. Again I recommend lining your lips first with a yellow eyeliner for a base because yellow pigments are always sheer but the formula allows for building the product up. They all are too the almost neon pink shade are patch and it think they only really work in a cream lipstick formula as sheer colours. You can make them work with a base to block out you natural lip colour but it so much effort to get them to show up smoothly.